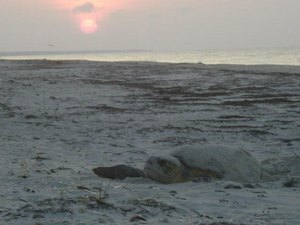 Last week as I was doing my dawn patrol I saw something ahead that was unusual - just one turtle track leading from the water. No return track. Hmmm. Then I looked further up the beach towards the dune, and there was a low dark mound, but at first I couldn't tell what it was - it didn't seem to be moving at all. Well, it was, just slowly, turtle speed. 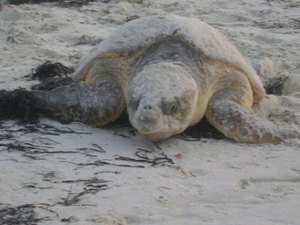 It was a mother loggerhead turtle who was just finishing up covering up her nest. 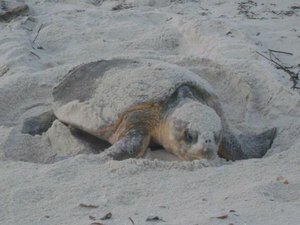 She was in the process of pushing sand under and behind her, then pounding it down with her big body to pack the sand over the nest chamber she had just finished with. I looked both ways, up and down the beach, not a soul in sight. I looked all up on the decks of the houses nearby. No one. My cell phone was on the last dregs of its battery - I had forgotten to charge it that night. So I quietly watched, took a few photos, and finally way in the distance I saw a figure walking my way - it was a woman I had met the previous morning on dawn patrol who was here on vacation, and happened to be an early riser and beach walker. So, she got to share the last 15 minutes or so of this remarkable sight. The mama turtle threw sand for probably 10 minutes, flipping it up high up behind her and over her shell with her flippers - this is the last stage of the nesting process, when they throw sand, presumably to disguise the nest. We of course have no real idea of why they do anything, but they always seem to follow this same pattern of flipping sand as they are finishing up. When she was through, she turned and started back towards the water, and we quickly took some measurements of her shell and checked her over carefully for any tags or defining scars - she had neither. Her shell was 37 inches from notch (right behind her head) to tail, and 34 inches over the highest dome of her back from side to side. For a big animal, walking by pushing her way through the sand with flippers, not feet, she moved pretty quickly. And, when she hit the water, she was gone - flying, back in her natural element and full glory.